This pretty picture of a seashell with orange inside came from a contributor at the Pixabay site. I’ve noticed over the years that more and more wonderful seashell photography has been added to the free to use, public domain site. I will be honest and say that I don’t know what this shell is. Users of Pixbay don’t usually list where the shell was found, and users live all over the world. The one who uploaded this shell picture is from the Czech Republic. 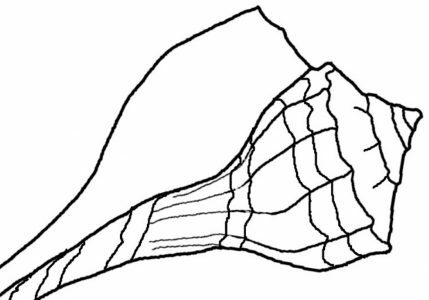 This shell is a gastropod with a short spire (top swirl). The only info I have are the tag words posted with the picture, which are “seashell”, “sea”, and “the clams”. A clam shell is a bi-valve – comes in two parts – so I would say this is not a clam. At least it’s not any kind of clam I have seen. If I had to guess, I’d say it’s a whelk or a conch, which does not really narrow it down much! It looks to me like the tail of the shell might be broken. See how the dark orange on the inner lip abruptly ends? If it once had a longer tail the shell would take on a different appearance. And how long was the tail? We can only guess. We also don’t know the true size of this shell. It could be quite large, or the photo could be a macro image of a very tiny shell. If that is the case, it could be a Florida rock snail, which only grows to around 3 inches long. All this information is used to identify mollusks, and we don’t have access to it. I’m not even sure if the photo below (by the same user at Pixabay) is of this same shell, but I assume it is. Do you have any guesses as to what type of shell it is? Maybe you know it’s name. If so, please share.